Get Physically Fit and Save a Pretty Penny By Exercising at Home ~ Follow These Tips for Getting Fit at Home! According to the authors of Freakonomics, people who purchase gym memberships overestimate their attendance by 70 percent. As a result, over $500 of the average annual cost of memberships is simply lining the pockets of gym owners -- and doing absolutely nothing for your waistline. If you struggle with getting to the gym every day, try getting fit at home for a fraction of the cost. Though you may not have the fancy equipment offered by fitness clubs, you can still meet your goals affordably by considering the following tips. Gyms undergoing renovations -- or simply making upgrades to their fitness equipment -- usually sell off their old stuff at killer prices. Call around to find out if any local fitness centers are currently selling old treadmills, stationary bikes or benches, or if they have any plans to do so in the near future. Fitness equipment is definitely one of those items best purchased used, if possible. In addition to scanning Craigslist and hitting up local garage sales, you can also look for remanufactured options online at Wayfair.com. When buying from private seller, be sure to research the brand and test the equipment before agreeing to purchase it. You can often find great deals on fitness clothing and accessories by shopping online. Compare promotions and avoid delivery costs with such sites as FreeShipping.org, which offers discounts from popular sporting good stores. For example, you can save $10 on orders of $60 or more with a FinishLine coupon. Squats, push ups, tricep dips and many other moves are all great ways to workout without the added cost of equipment. You can also get creative with items around your house. A chair is a great tool for step ups, tricep dips and decline push ups. Water bottles can be used in place of small hand weights and your child's jump rope is a great way to burn calories quickly. Suspension training systems -- which use a series of straps in addition to body weight -- are a popular way to intensify home workouts without bulky fitness equipment. TRX is likely the most well-known system but requires a significant investment. GoFit's Gravity Bar and straps offers an affordable alternative, and also travels easily for when you hit the road. Discount retailers are great resources for basic fitness accessories like DVDs, yoga mats, stability balls, fitness clothing and more. For example, a friend of mine recently found yoga blocks at TJMaxx for $5 each. Similar blocks at REI cost $15 each, over 60 percent of what she paid for them. Get free workout tips on your phone with apps like GymGoal ABC, which features 280 animated exercises and 52 workout routines that are adjustable to four levels of expertise. You can also find free personal training videos online at sites like BodyRock or FitnessMagazine.com. If you pay for cable, take advantage of the morning fitness videos available on Discovery Fit & Health. Shake Weight, anyone? Products boasting quick weight loss with minimal effort are usually too good to be true. No pain, no gain, remember? Don't fall for the hype and read reviews before buying the latest and greatest DVD set or fitness system. There are some great ones being released on the market all the time, but ask for recommendations first. Like most Americans, you likely pay a lot for your health insurance premiums. Healthy policyholders means less risk for pricey doctor's bills, and select health insurance providers offer incentives for fitness programs. Check with your provider for fitness programs that offer discounts on activewear, fitness rentals and equipment purchases. Andrea Woroch is a nationally-recognized consumer and money-saving expert who helps consumers live on less without radically changing their lifestyles. From smart spending tips to personal finance advice, Andrea transforms everyday consumers into savvy shoppers. 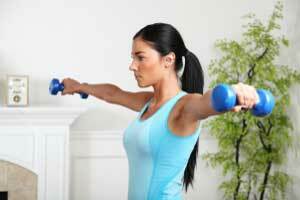 Do you believe you can get just as physically fit at home versus going to the gym? Why or why not?